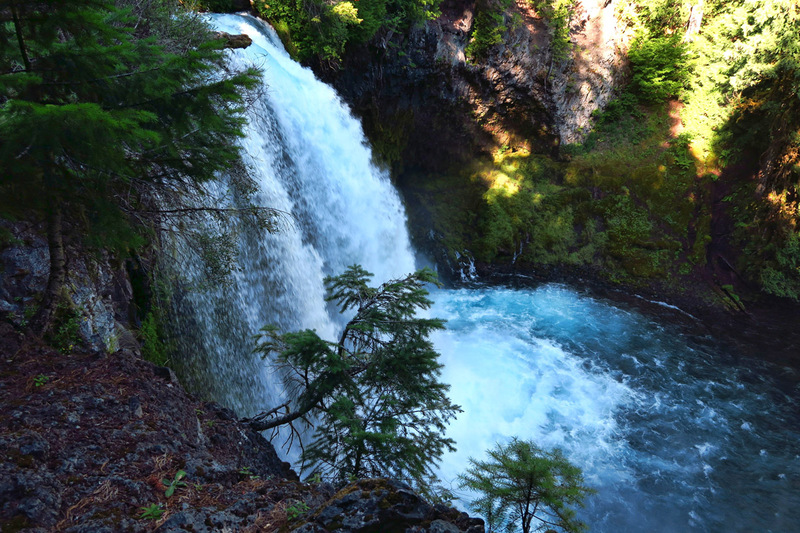 During my 2014 visit to Eugene, I took a day trip in the Tracker up to the McKenzie River area. 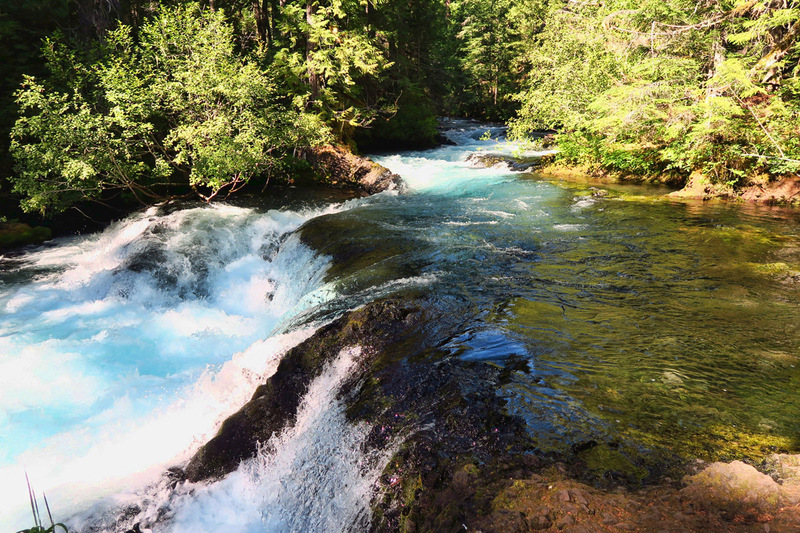 I was instantly enamored by the gorgeous clear river cascading through the scenic densely wooded forest. I wrote a blog post about the agonizing choice of how to spend my limited time with so many things to do in one location. I wanted to stay longer, but couldn’t due to my need to be near a strong, steady connection for work. The lake is fed from snow melt, but primarily spring-fed. It’s an icy 40-45 degrees, so clear you can see rocks and trees beneath the surface. 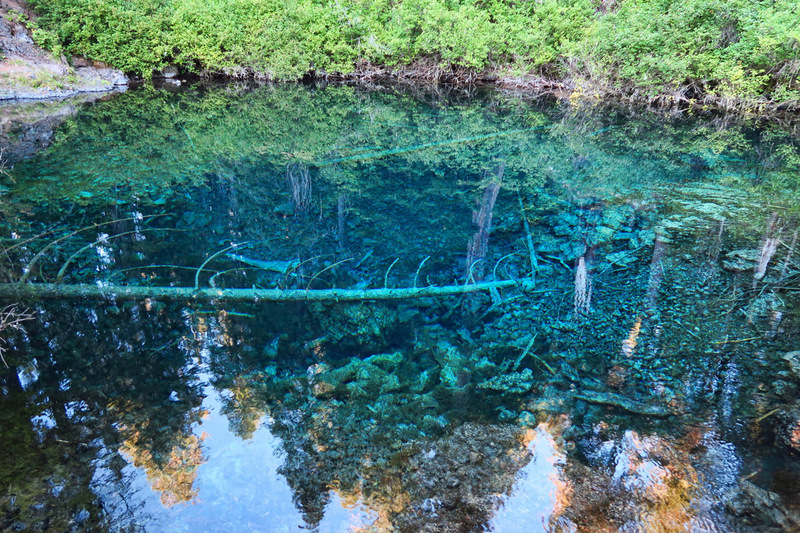 Many underwater trees were preserved by the cold fresh water. This is truly an outdoor lover’s playground. 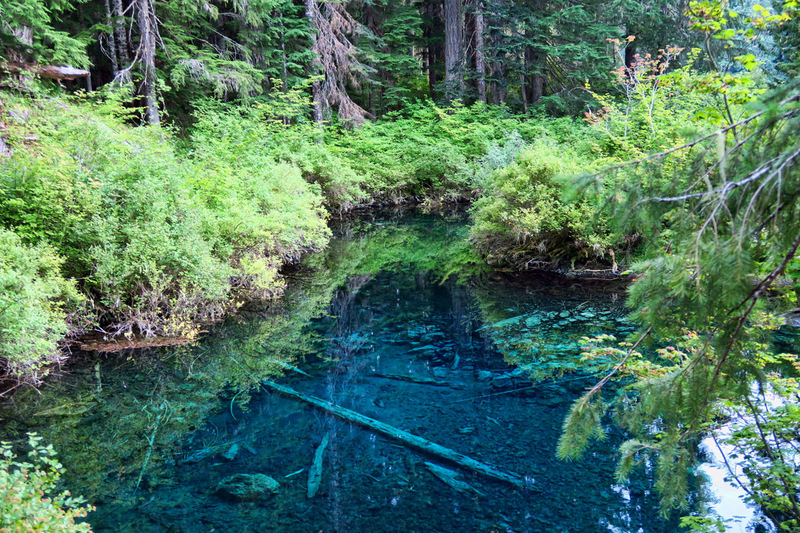 There is the 26 mile hike and bike McKenzie River Trail that parallels the river, as well as hiking “spurs” leading off in all directions through lava flows, around lakes, and deep into the Sisters Wilderness. So it seems like the perfect retreat to get me over my divine discontent from too much fog, fleece, and fish & chips along the Oregon coast. 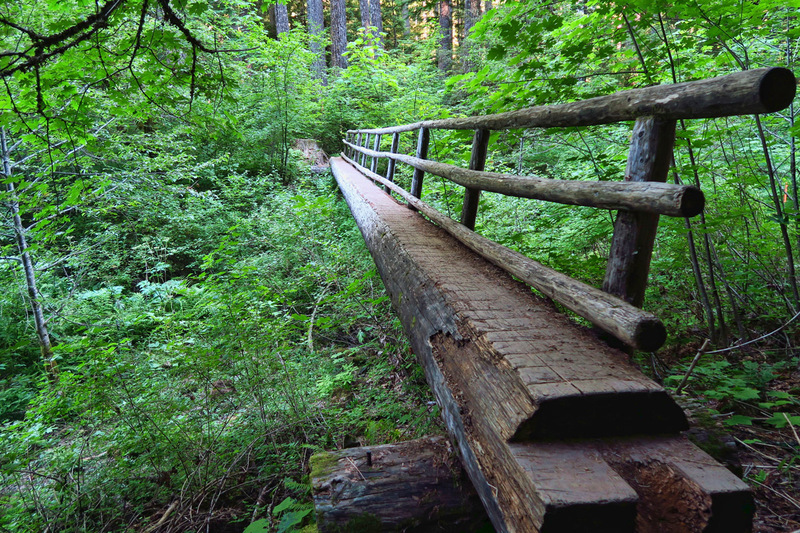 There is a nice 5 mile hiking trail that goes around Clear Lake. “You must be this skinny to cross this bridge.” It’s one continuous log, and yes, it does bounce! 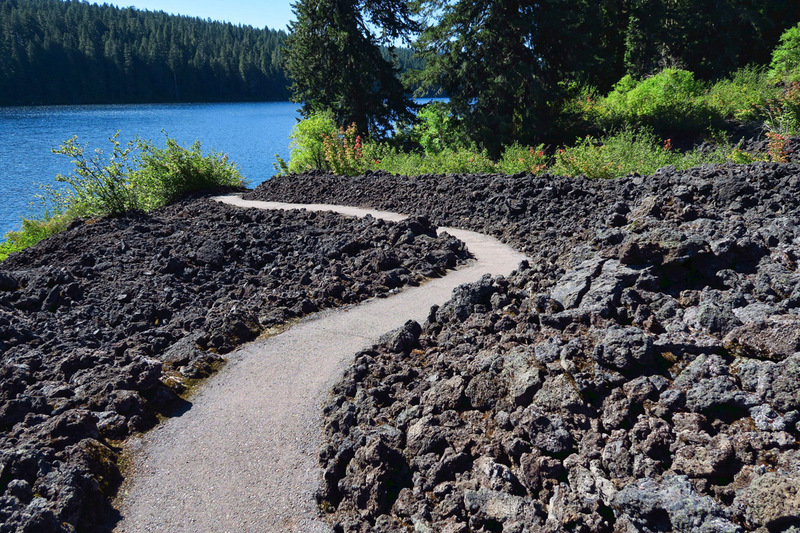 The eastern side of the lake loop hiking trail goes through a large lava field. This small spring-fed pool flows into the lake. Once again, I am headed into a heavily touristed area with no reservations, hoping for either a cancellation or a crack at a first come/first serve space. 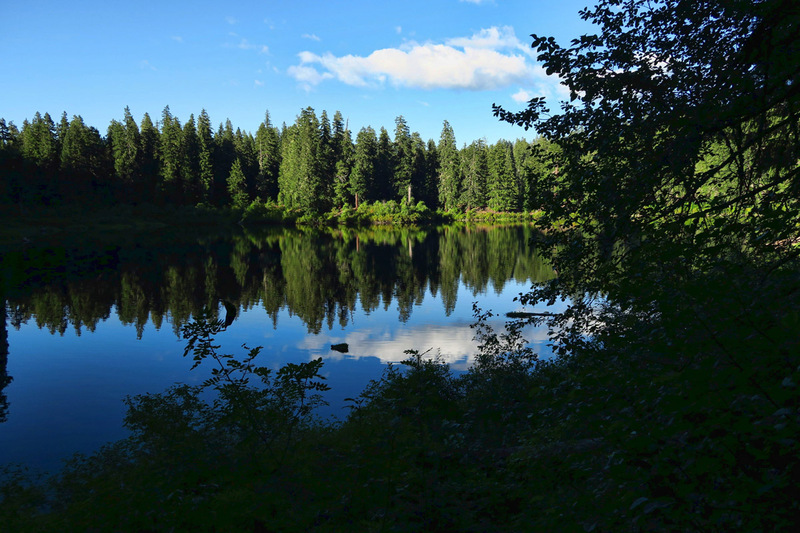 There are five Forest Service campgrounds that line the McKenzie River, all but one of them requiring reservations according to the Forest Service website. 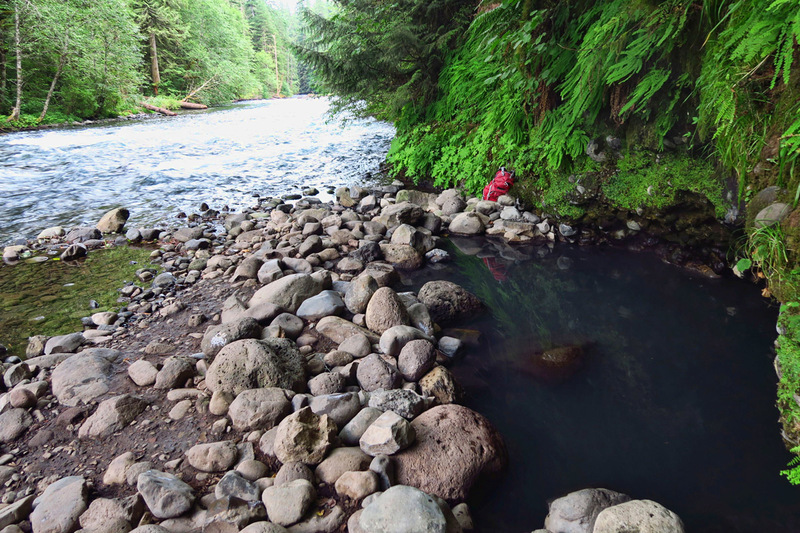 But after a stop at the McKenzie River Ranger Station, I learn that each of these “Reserved” campgrounds also saves back about one third of its sites for first come/first serve. The perfect combination to accommodate the planners and non-planners! 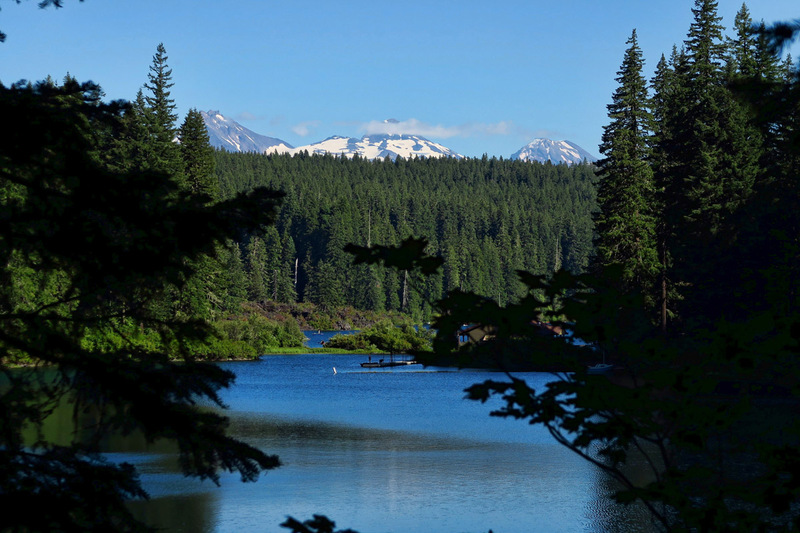 The three “Sisters” mountains can be seen from the lake’s edge. Elevation 3,000 ft of the lake makes for perfect temp and no bugs. Clear Lake is a “quiet lake” with no motors allowed. Many people fish from kayaks and rowboats. 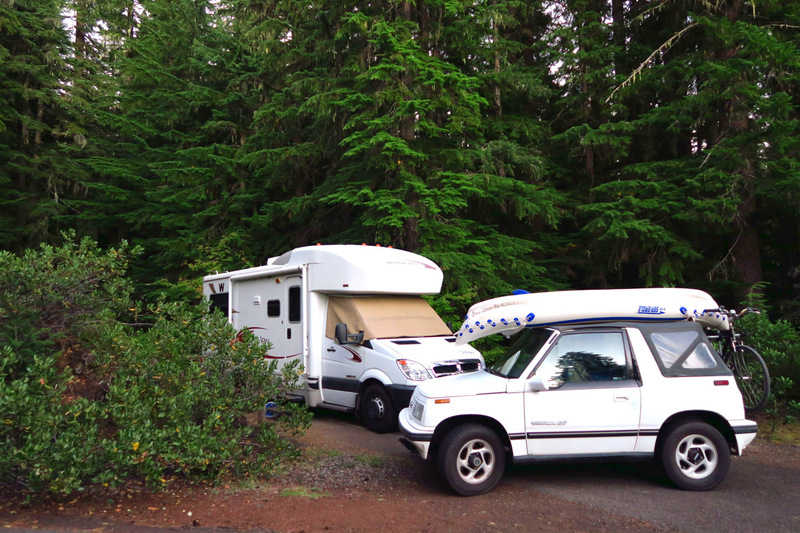 Site #1 at Coldwater Cove Campground alongside Clear Lake. 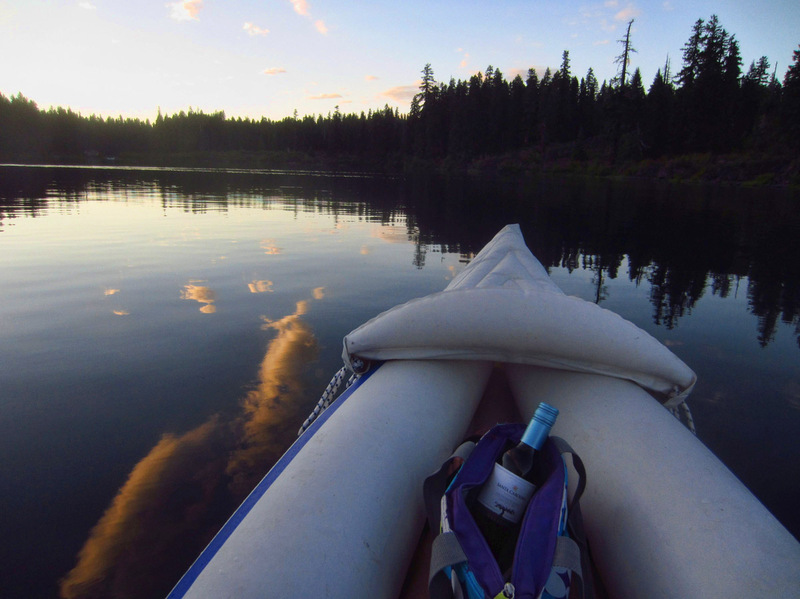 One of my favorite memories from my stay there, a little vino on a sunset paddle. Sunsets on this lake were stunning, every night. Ten yards from my campsite….I realize it seems ridiculous, but I swear it’s real! When I arrive at Coldwater Cove, I am met by a very friendly camp host making the rounds in her golf cart. She tells me, “I’ve got three spots left where you might fit. Pull over and park it, and hop in. We’ll go take a look!” After driving around, I have narrowed it down to two spaces, as one is too shady for my solar. I ask her which one she would choose. She responds enthusiastically, “Number 1! Why? KIDS!! Too many kids….ill-behaved kids down at the other end!” SOLD! 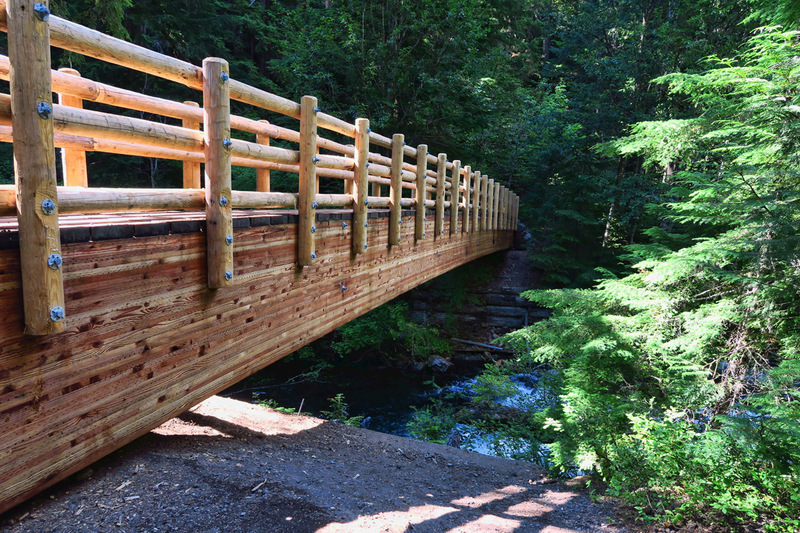 Just 1 mile from the campground, the McKenzie River Trail intersects the Waterfalls Trail near this nice new bridge! 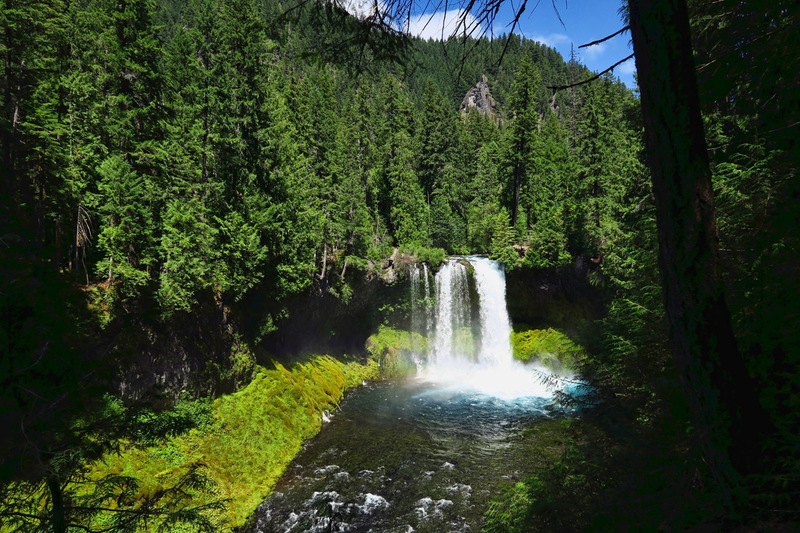 The 1.5 mile Waterfall Trail follows alongside the McKenzie River. 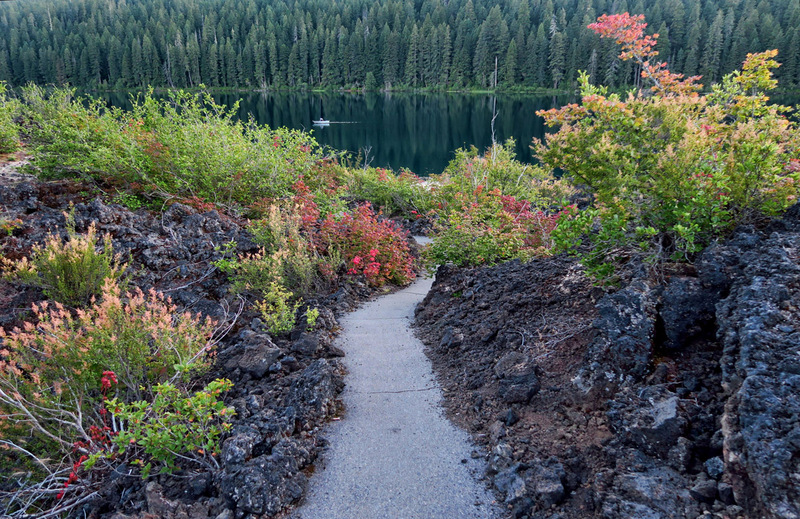 Follow to the Carmen Reservoir, and return via McKenzie River Trail for a 3 mile loop. 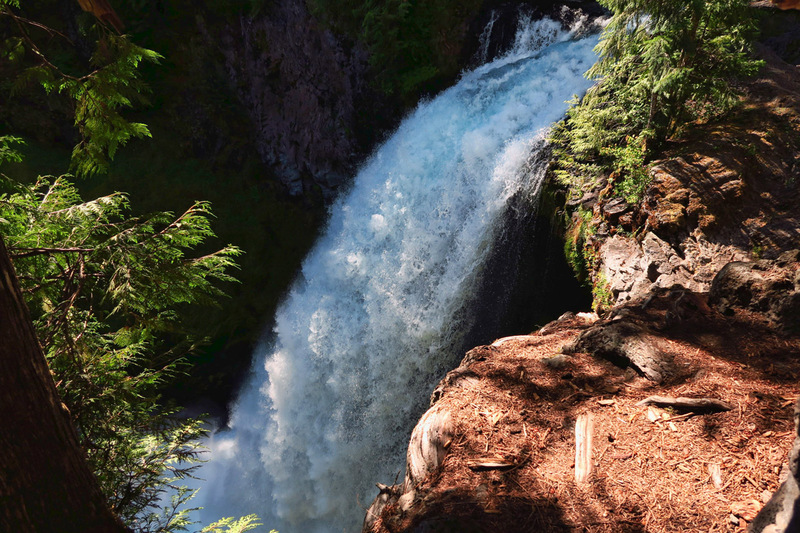 Sahalie Falls, about a 75 ft drop. Koosah Falls, about a 65 ft drop. In springtime, it is reported to be as wide as it is long. Koosah from McKenzie River Trail. 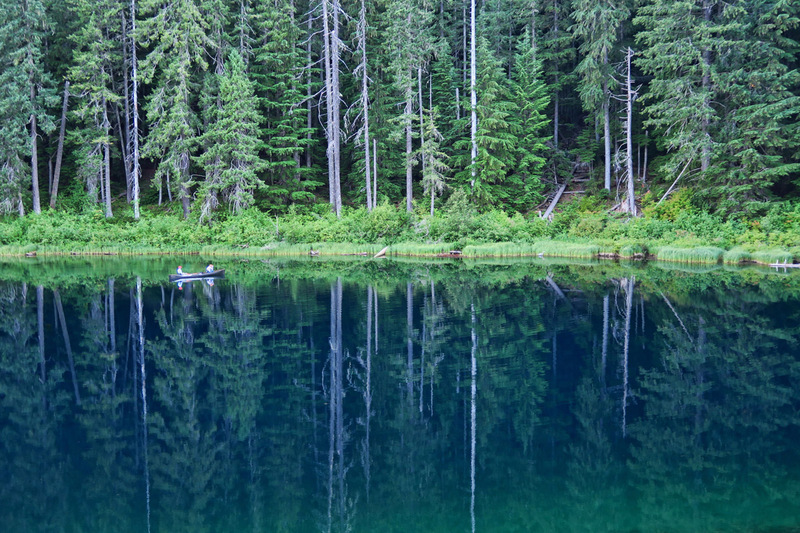 The McKenzie River Trail is best known as a 26 mile mountain bike trail. I hoped to catch someone crossing one of these many narrow bridges with a bike, but my timing was never right. So five straight days of silence (okay, so I did drive in 20 miles mid-stay for provisions. Had nothing to do with checking emails!) 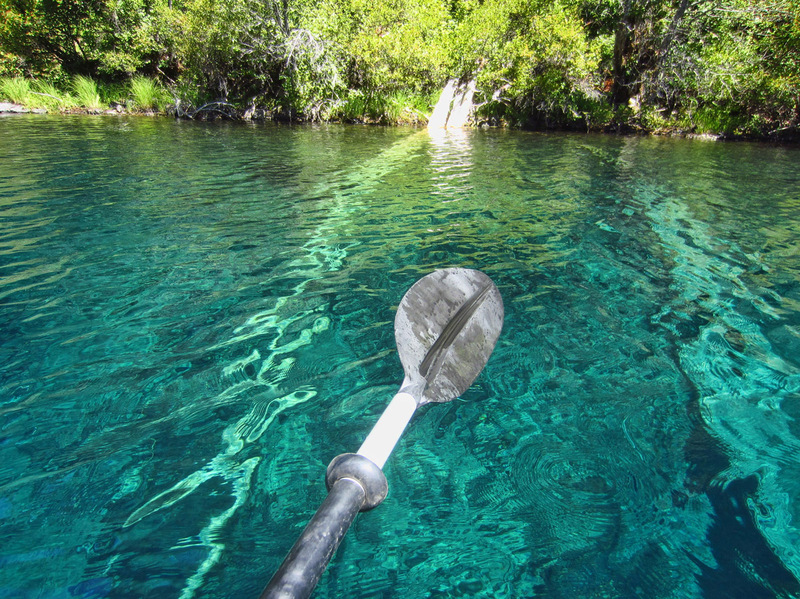 I spend my five day retreat kayaking the gloriously clear Clear Lake. 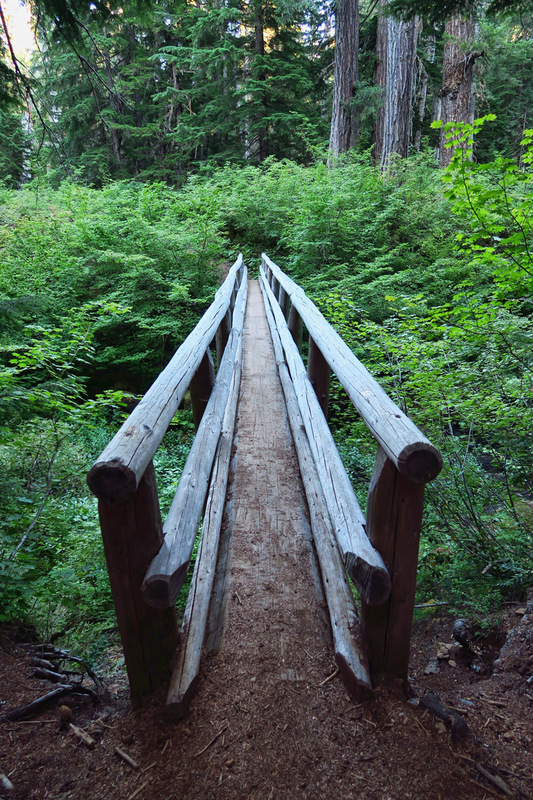 I hike every day through the woods or alongside waterfalls on the McKenzie River Trail; one day a 13-miler. 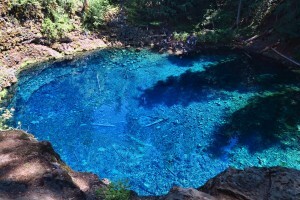 I have a picnic lunch at the indescribable Blue Pool, a phenomena that occurs where the McKenzie River goes below ground through lava for a stretch, then emerges into a Windex-colored frigid pool before tumbling back into a river. I soak in the hot springs. 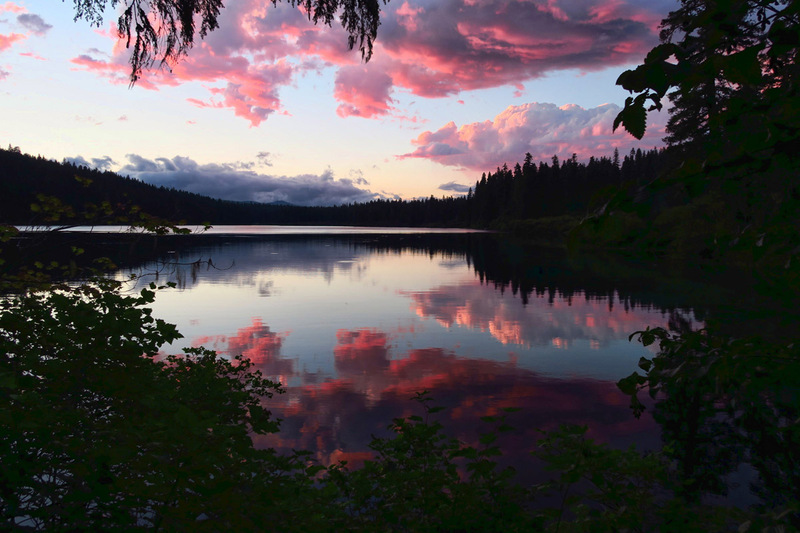 Paddle across the lake for marionberry pie at the rustic Clear Lake Lodge. And sleep like a dead person. Natural hot springs along the river near Deer Creek Rd. 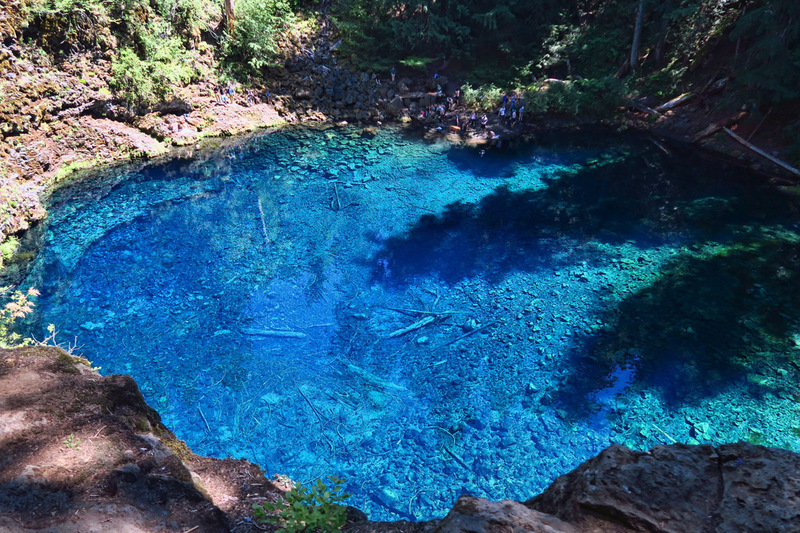 The incredible Tamolitch Blue Pool. (Note people on far side for perspective.) Though it appears shallow, it is approx 30 ft at the deep end. “Lunch with a View” Pool is 70 ft below. McKenzie River goes underground back up a way, and re-emerges through lava tubes into this pool. Some brave swimmers, but at 40 degrees they didn’t stay long! Come Sunday, my head is as clear as Clear Lake. As I am driving back to Eugene, I think that being without a signal was not such a bad thing. I read. I cooked and cleaned. I wrote. And enjoyed the entire experience. I congratulate myself for breaking my addiction…for finding ways to occupy my mind and entertain myself with no internet. I tell myself maybe it would be good to disconnect like this more often. 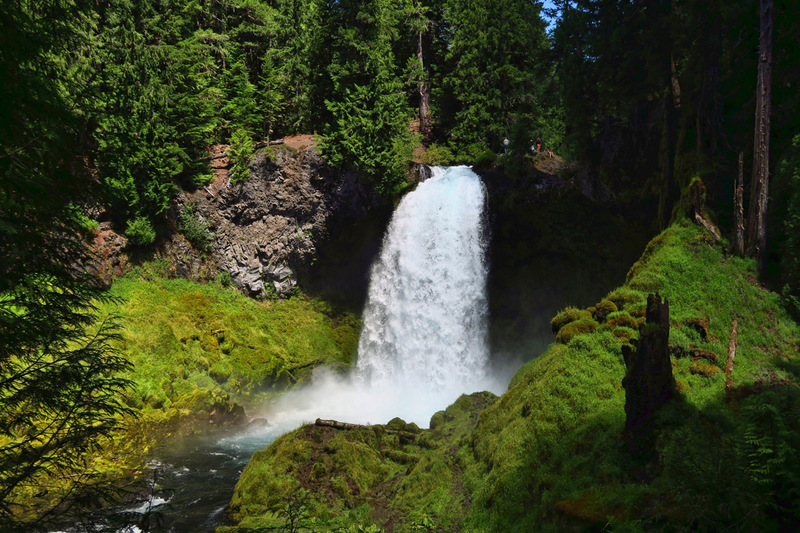 This entry was posted in Oregon and tagged Clear Lake, Coldwater Cove Campground, Koosah Falls, McKenzie River, Sahalie Falls by Suzanne. Bookmark the permalink. I love that you got such a really gorgeous site by just walking in. Even in Oregon. It looks and sounds like a slice of heaven. You must have been there nearly a week. It doesn’t seem that long since you’ve posted. Very envious of all the things I love to do so close by for you. All the hiking and kayaking. FINE! Hi, Sherry — Nice to hear from you. I stayed for five days. I always seem to run at least a week behind on the blog, which is why it wasn’t that long since I posted, because I am in perpetual “catch up mode.” I am now back on the coast in Lincoln City, Oregon. That is such a lovely area. Our day trip was not enough and I would love to go back. Just not sure Jim would be up for all those trees and no internet! That’s a place I would really love to visit. Oh, the evils of our phones and internet. I try to get away, but my daughter worries. I need to get that satelite device to keep her happy. I went to Fort Davis State Park to escape the heat in San Antonio. On the drive back, a ton of texts from my daughter and sister (about my Dads health) kept pinging as I was driving. Its our lifeline to the world outside of RVing. Wonderful retreat and thanks for sharing your gorgeous photos. Beautiful, cool, and NO BUGS! Sounds like heaven. I can’t believe you found such a great spot right here in our very own Oregon. We hiked the falls on a trip up the MacKenzie but didn’t take time to stay. Must do now!! That blue pool!! And springs!! That whole McKenzie River corridor is wonderful! We’ve not admired Clear Lake though, looks like we need to remedy that! 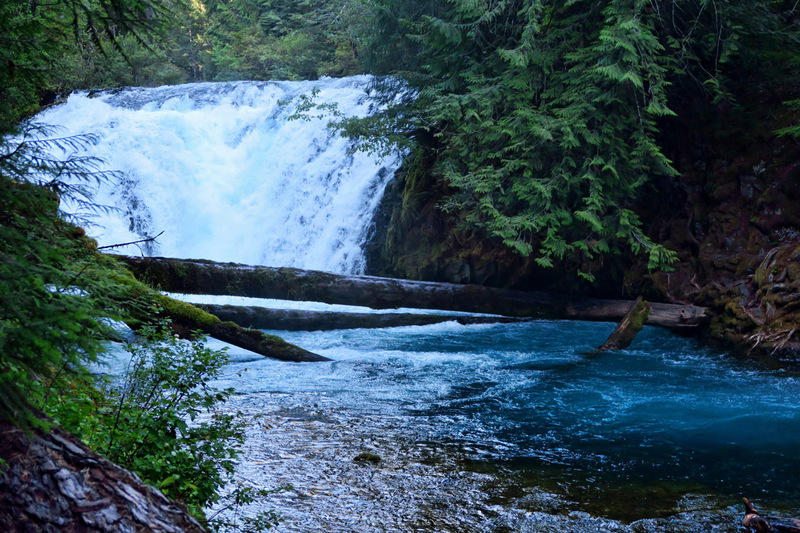 Amazing how clear that water is…beautiful…as are the waterfalls, the blue pool, the log bridge…..everything! One of our favorite areas in Oregon. Glad you were able to escape the Coastal gloom and enjoy. It’s so rejuvenating to take a break from internet/emails/phone. At least, that’s what I tell myself. Currently, though, it’s driving me crazy—I’ve spent the past six weeks on Lopez Island with random coverage. I think random is worse than none! What a gorgeous spot you found to disconnect, though. 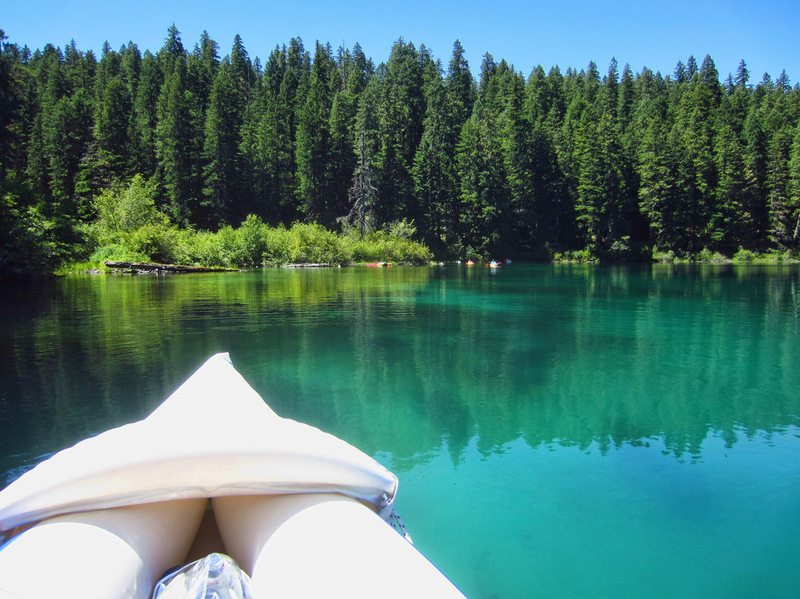 I can’t believe in all of our Oregon adventures that we’ve never (yet) been to that area of the McKenzie River. 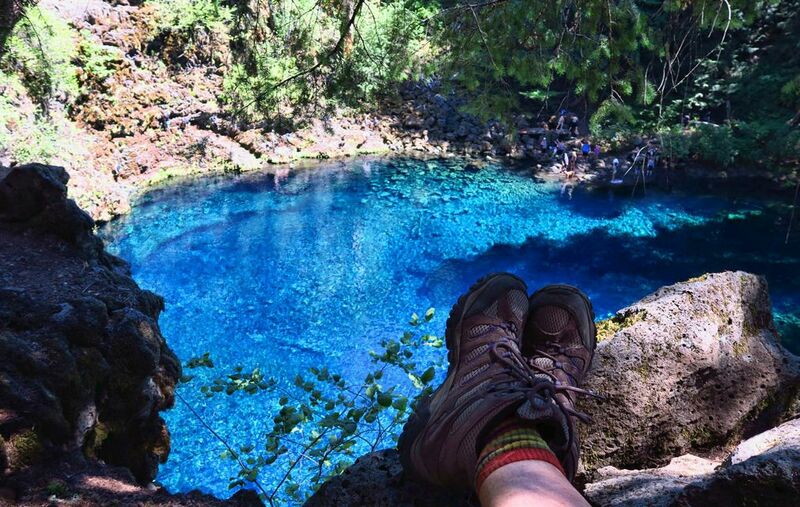 Your photos make it look like paradise—the color of the pools, the waterfalls, the trails, and that sweet campsite! Thank you for your beautiful post on this area. The beauty seems beyond description, but your photography succeeded in doing it so well. I must put Clear lake and Mckenzie river area on my bucket list with havasu falls. I have been researching light weight kayaks including the Sea Eagle. My friends give me a hard time when I mention inflatable, responding with the inflatable- deflatable gibe. You seen to take it everywhere, but are you concerned about hidden rocks and stumps ? Just a quick response as time allows, thanks. Hi, Bobbie — Sorry, I just realized today that I never answered your question. Please forgive the delay! I do worry a little bit about rocks and stumps, but the thing I like about the Sea Eagle is that it has five different inflatable “chambers.” So if I were to hit a snag and one were to deflate, I still have four more to get me back to shore. And I don’t take it in rough waters. I never leave shore without my pump and a PFD in the kayak with me, so I feel pretty safe. If in doubt, you could also go for their more expensive offerings. I have the lowest end of the Sea Eagle line. The more expensive ones are much more rugged. Mine was $300, as I recall. For as infrequently as I use it, the inflatable is the only practical option for me, as I wouldn’t want to cart around a “hard side” kayak when I only get to use it 4 or 5 times a year. So the inflatable suits my need. I can have it pumped up in about 15 minutes, and it only weighs 26 lbs. Let me know if you have any more questions…and thanks for the great question. Great to have a glimpse into your wonderful retreat. Your photos are incredible. Thanks for sharing. I find it’s the phone, not the computer these days that takes my time. What a perfect place to retreat to and isn’t it amazing the difference in perspectives when you aren’t having to work while traveling. This looks like a spot I shall have to put on my radar for some off season camping next time I am out there. Nice!!! 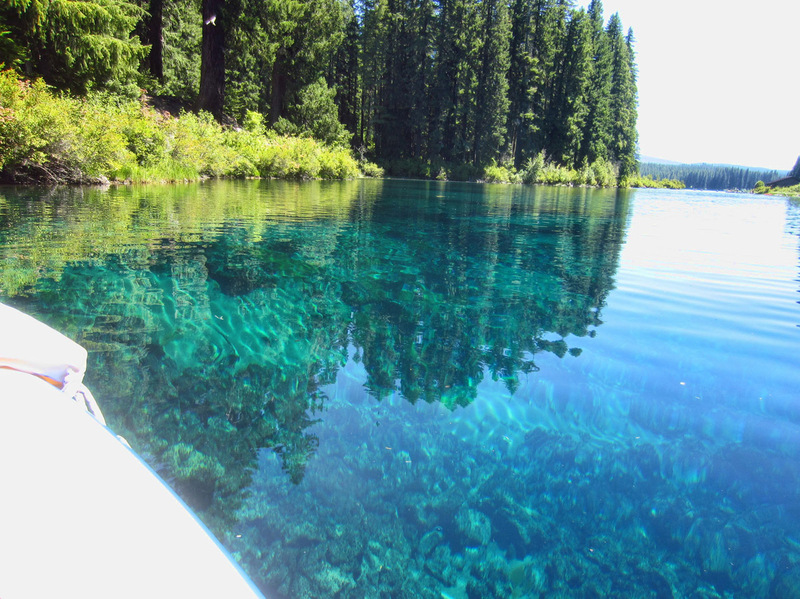 Five days paddling on the McKenzie River? Sign me up! 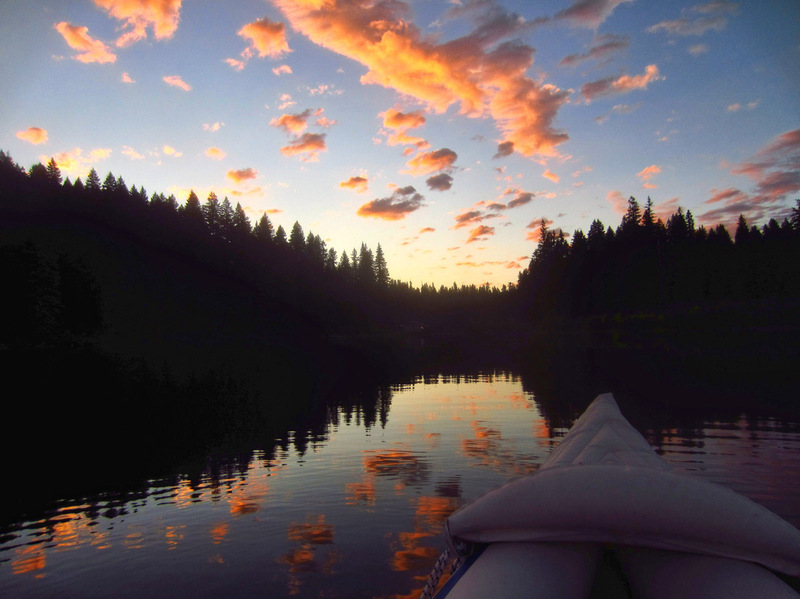 A sunset paddle with a little vino…heavenly! It sounds like you made the right decision to take a break from the coast. We loved both Sahalie and Koosah Falls. Chris and I will go there this year while on one of our visits to Oregon. It Looks just amazing and some place we would love!! Thank you for the beautiful pictures and prose, you have the gift my friend! Enjoy the rest of Oregon!!! Oh, Suzanne, what a wonderful place:) The waters were all so gorgeous and the falls were flowing with such force. Just beautiful! I think being without connectivity is something we all need once in awhile. Just enjoy the simple things is a pleasure. But it is hard to not be connected! Your lunch with a view is perfect:) Love that light blue water!! Clever steps over the tree trunk! 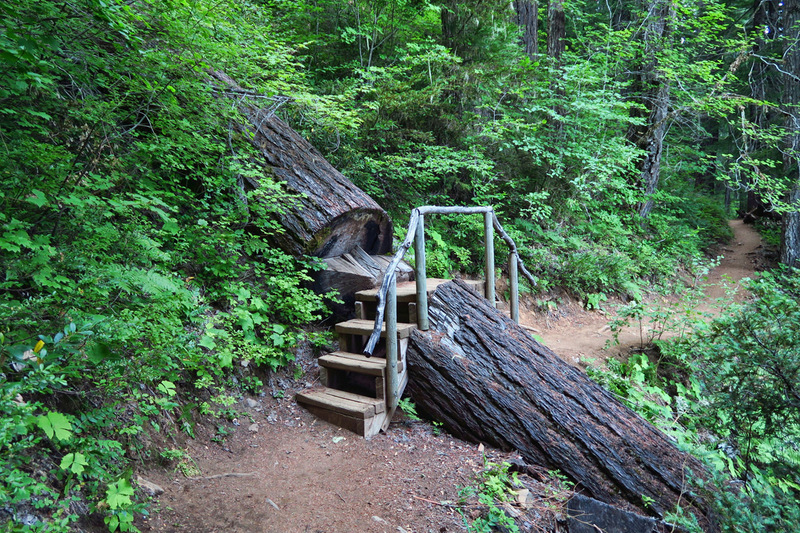 We saw this done on one of our hikes and I was very impressed. Suzanne, thank you for sharing that wonderful place. Stunning photographs. A new place to add to my bucket list. I could hang by those wonderful waters for quite awhile, connection or not. Great recovery place. Looks and reads as though you have just spent some time in heaven. Clear water, clear skies, wonderful waterfalls and swimming pools, quiet, no signal and a little vin to help pass the sunsets. I am full of envious thoughts. Oh dear, I might get there with Pete and decide to never leave. Beautiful, stunning, lucky you. Thank you for sharing it!